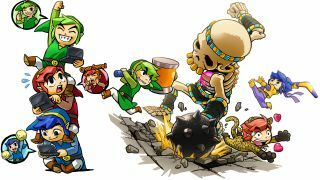 The Legend of Zelda: Tri Force Heroes will give me a reason to unearth my Nintendo 3DS after E3 2015, and I'm fully expecting to pull the underutilized system out of a treasure chest with the series' patented chime when it releases later this year. This top-down Zelda video game with a three-player cooperative twist makes up for the fact that Nintendo failed to demo the new Legend of Zelda game for Wii U. It's been teased since January 2013, but won't launch until 2016. Magically healing that pain point, my Tri Force Heroes demo for 3DS ended up being more fun than any other game I played during the Los Angeles-based conference. Of course, I owe that personal "best of E3" honor to the fact that I was in the ideal situation: two friends were playing alongside me... in person. Yes, an online mode when two buddies aren't nearby. Alas, Nintendo's inability to spearhead proper online gameplay will hold this title back from true greatness. My Tri Force Heroes demo for 3DS ended up being more fun than any other game I played at E3 2015. Assuming the roles of a red, green and blue link in Legend of Zelda: Tri Force Heroes, two friends and I set off on what ended up being our longest E3 demo. It took a full 25 minutes to play through one level and a challenging boss battle. You know you're having fun when you don't realize how annoyed the people are waiting in line behind you. I was drawn into the classic overhead perspective in this game, which is mixed with cartoon-like The Legend of Zelda: Wind Waker graphics, giving it a 2D design with an updated look. The cooperative multiplayer gameplay was also a new spin on an old form. It made us work together to solve intricate puzzles and sword-slash enemies along the way. Teamwork often required using our special abilities, like using a wind-blowing gust jar to send another Link across a gap. As the one person equipped with bombs instead, I was the one hurtled across dangerous pits to open up blocked pathways. No one has to fight over being Link and hearts are shared in this game, too. You can have a straggler Link on the team and succeed. Communication is essential in this co-op game, and that's exactly what we experienced while playing through our demo standing within inches of each other. But out of that close range makes all of the shouting and softly muttered curses in Nintendo's family friendly E3 booth impossible. The chaotic fun of talking to each other is absent in online multiplayer. There's no voice chat available in this game and it's sorely missed. There's no other built-in way to artfully solve puzzles and call attention to needing to form a three-person totem pole in order to reach new heights. Prepare for FaceTime and WhatsApp video calls, friends. Another strange multiplayer limitation I found on the show floor was that while this is a three-player game, it's not simply "up to three players." It's one OR three players. That's an odd number for a co-op game, a mode that usually translates into a two-player campaign. It might as well be titled "The Legend of Zelda: Forced Tri Heroes." For now, playing this game with friends in person is the only real way to get the full experience. One day, maybe with Nintendo NX, the company will get online gaming right.